Flights of Fancy: Do children learn what they live? 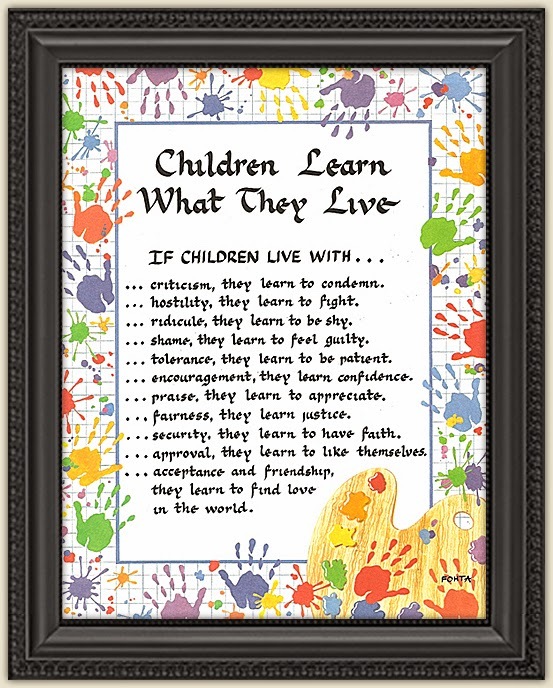 Do children learn what they live? My grandmother was in town and I really wanted her to come and spend some time with us at home. She is 92 and in many ways I feel grateful to both my grandmothers for taking care of me perhaps when I really needed that the most. My father's mother was with me through my growing years and until my late teens, while my mother's mother took care of me up to the end of my first year, besides our numerous summer holidays in Bangalore. I felt that it was my turn now to do my little bit for her. But I had to ask Raghav, as that is what we usually do. We consider him as an individual in our house and family, with his own views on things and people. He is also a person who likes to be prepared for changes in routine or sharing of space at home. We have respected that all along, and we did the same this time too. I was telling Raghav how my grandmother had taken care of me when my parents had left me for a month with her, when I was five months old and they had to go to Australia. I shared with him stories of how she had brought up nine children of her own, and how they also took care of me. I also shared how important is was for me to have her home with us for a few days atleast this time. He seemed to understand. In fact, he said he would love to have her and listen to those stories from her. She was special to him. I knew that from the way he spoke. I remembered fondly how she came all the way to be with him as a newborn baby, giving him an oil massage, bathing him, cooking for him, changing him, talking to him and rocking him to sleep with a pillow on her legs. Perhaps there was some kind of connection that he felt with her, for she is one of the very few who are privileged to hug and kiss him at will. I was happy that he understood. I spoke to her, and she agreed to come the following day. Meanwhile, Raghav was on a building marathon. He had announced to us that he was going to build a farm today and set off. While I was busy in the kitchen, he kept coming to me with different things that he had built, one after the other. There was a barn, a tree house, fields, a stable, a pig sty, a sheep pen, a farm shop, a compost bin, a tractor with trailer, a combine harvester, a cow shed and more! After building all this, he wanted to set it up in a space that wouldn't be disturbed and play with it. Since the best place for that was his own room, we decided to set it up there and cleaned and made the space for it. Raghav was very happy and we played our usual pretend game, making up dialogues for each person, weaving in a story et al. Later, he wanted to get building other things again, but was frustrated that he couldn't use the whole room, as it was full of the things for the farm. He couldn't access his drawers and bricks, and also did not want to move the farm anywhere else, as he felt they would not fit in any other space. After a lot of back and forth, bouts of crying and the pain of not understanding how the same space could be created in another place, he finally agreed to give my idea of moving all of it to the guest bedroom, a try. I had to measure the floor area to show him that the space he had used in this room was possible to create in the other one as well. He finally understood. So I drew a map of the farm - where he had placed what, and we moved it all to the top of the guest bed. Raghav painstakingly set it all up to the last detail, according to the map, even pointing out an error on my part of not drawing one thing to scale! A little later, I got a call from my mother, to say that she would bring my grandmother that evening, to stay with us overnight, until the following evening. I did not know whether to smile or cry. She was supposed to come only the following day, and Raghav had just set up everything to play. I expected a meltdown from Raghav. After all that measuring and setting up of the farm, so that it wouldn't be disturbed, now it would have to be disturbed as my grandmother would need the bed. There was no other space she could sleep in. I did not know what to do. I did not want to disappoint Raghav; and nor did I want to say no to my grandmother. I stayed with my feelings for a while, but started getting anxious. "How could I tell them that she could not come because Raghav needed that space for his Lego?" "How can I tell Raghav that she was more important than his Lego?" Both were important to me. I wanted to respect both. And yet I feared Raghav's reaction. he probably empathised with Raghav instantly :). He told me that I should call my mother and tell them that they could not come today, but could perhaps come the following week to stay. While I was relieved and happy about this new connection he had made, I still could not get down to saying that to my grandmother, who I had invited. I said okay and hung up. I guess my heart knew that my son was ready to understand and respect another's feelings. I did not think anymore. I just walked up to him and told him what I felt and what had happened. He teared up a bit, but agreed to move all his stuff back to his room and not play with it the way he wanted to, until my grandmother had left. There was no long-drawn explanation needed from me. There was no meltdown like I had feared. He had simply understood. I was relieved and happy that I had followed my heart. It has not let me down till today. We carried everything back to his room from the bed, and set it up in a corner, so he could access his other Lego bricks too. Everything had worked out peacefully and beautifully. I realised how the Universe had choreographed this so beautifully for all of us. I am grateful for that. I also realised today that my trust in my child has deepened, and so had his. I believe that when children have been given the respect that is due to them, they will understand and show respect to others. When they have been given the space they need, they will make or create the space that others need. When they have been listened to, they will learn to listen to others. Many years ago, I had learned this from a little group of children in a sacred little space (not school) called Bhavya, in Bangalore, which we had gone to visit. That was one of the first few spaces where Raghav was comfortable instantly, and did not even need me. I believe that there are some spaces where he perhaps feels and senses the vibes and energies of people and feels drawn to be himself and explore. I want to share an excerpt from a blog post that I wrote earlier about our experience in Bhavya, that first opened my eyes to empathy, respect and trust and what they really mean. I realised then what extent kids can go to, to listen deeply, trust and show respect to another human being - even someone who they had never met before. Can we as adults even come close to that, I wonder? Some of the kids were playing in the sand pit and Raghav wanted a spade and a bucket that they had, to play by himself. He just went up to them and asked without any hesitation whatsoever - something that he rarely does! I am usually asked to be his voice or mouthpiece - a role that I am quite used to now. One of them asked him to wait till he finished, while another handed one of the things over to him immediately. Raghav then dug a bit in the sand pit, imagining that he was cooking something, while some of the kids watched, and then wanted to move to another sandy area near the pit. Sensing that, my friend told him that the sand in the sand pit was cleaner and different from the other sand, and the other kids around asked him to be careful not to mix up the sand from the two areas. That was my first learning point from the kids - that little things that we might not really give much thought to, are SO important to them. The extent to which each of them went to understand how precious that creation was to my son, moved and touched me so deeply, that even today it brings tears to my eyes. And they did not know my son - that was the first time they were seeing him, and the first time he was seeing them. Yet, there was a huge effort to understand and interact with trust and empathy, spontaneously, without any adult intervention or facilitation. So then, do children really learn what they live? What do you think? Wonderful sharing. The extent to which a kid will go to make a mother happy when she is not, is itself reason enough to come out of that.